Beauty Blogger, Hairstylist and Makeup Artist. How to apply and wear a dark lipcolor. You will learn how to apply and wear a modern dark lipcolor. M.A.C. Prep + Prime Lips - it is a base to wear under lipstick. Adds light moisture, smoothes and refines lips. It improves the appearance of the lipcolor on top of the lips. M.A.C. Blot Powder/Pressed - it is primarily designed to provide shine control without adding any noticeable color or texture. It sets foundation, finishes faces, and also sets/creates a clean canvas on the lips prior to applying lipstick. 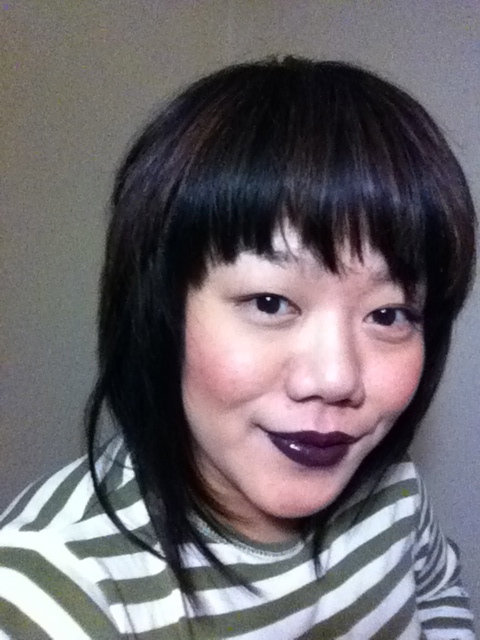 Rimmel; Lasting Finish by Kate Moss lipstick in 04 - deep violet lipcolor. Full lip coverage. Long lasting. Has light reflective elements which creates a gorgeous tone. Cover Girl; Wetslicks Fruit Spritzers Lipgloss in Blackberry Splash - has a fruity flavor, a lot of shine and feels like a lip balm! Which mean it is moisturizing, it locks in moisture for hours! Has a nice pigment. Step 1: after applying your foundation, apply your lip primer on the lips and around the lip line. Applying the lip primer around the lip line will keep your lipstick from bleeding, it will also keep your skin around your lip smooth. Step 2: Using a powder puff (I use the one that comes in with the powder) sweep some of the pressed powder over the lips and the lip line using a rolling and pressing motion. This will create a clean canvas for your lipstick. Step 3: apply your dark lipstick starting at the bow of the lip, top and bottom. Then apply it from the outer corner of the lips - connecting the lipcolor to the bow of the lips. This is easier and more efficient to apply your lipstick. Smack your lips lightly. Tip: you can use a darker lipstick as a lip stain. Apply the lipstick on your lips, then blot it couple times on a tissue or blotting paper to the desire texture and sheerness. Step 4: squirt a pea size of lipgloss on to the back of your hand. Dab the lipgloss on the bow of the lips only to create an illusion of a fuller lip. Tip: Because the lip color is so dark and deep of a tone, make sure to wear it with a softer look all over. Such as with a rosy blush and subtle soft eyes. This look has also been worn by Rihanna, so go rock it out! How to blow dry your hair in 5 minutes!